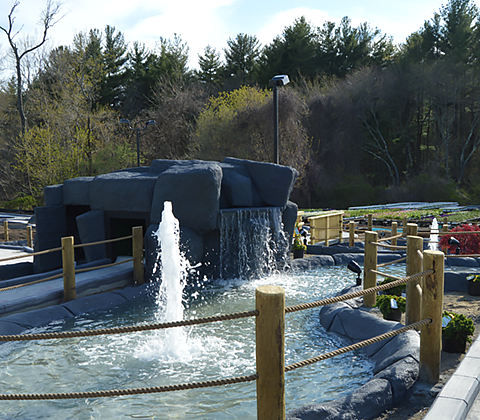 Nunan’s Mini Golf is the premier miniature golf course located on the North Shore of Massachusetts. 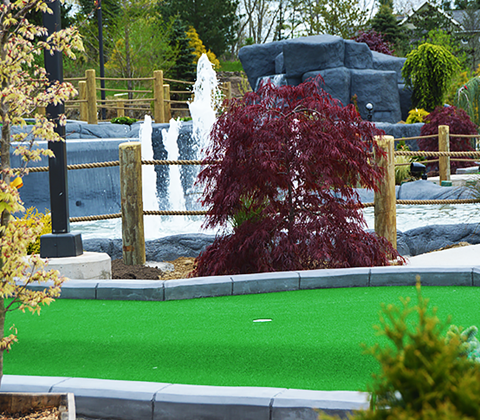 We dare you to find a mini golf course with a more beautifully landscaped course! Kallie’s Kones and Garden Golf will be opening alongside our brand new cafe, Café Sarina! Follow our Café Sarina Facebook page and Instagram @cafesarina for frequent updates! We are a florist and greenhouse, and take meticulous care of our mini golf course, which is complete with signage so you can learn more about the plants we’ve included around the putting greens. Our miniature golf course also includes some fun water features that golfers will need to putt around, over and through! A visit to our mini golf course isn’t complete without an ice cream from Kallie’s Kones, our on-site shop featuring Richardson’s Ice Cream. Bring the whole family for a fun afternoon or evening at Nunan’s! Come and play mini golf on Wacky Wednesdays, where we’ll add fun and exciting new rules to the game! Always check out the mini golf leaderboard, where you may find your own name if your score is low enough to earn you a spot. At the end of the year, you could be playing in our miniature golf tournament against the best of the best! If you get a hole-in-one, you’ll get a free small ice cream at Kallie’s Kones located right across the parking lot. Miniature golf is fun for the whole family! Looking for a spot to have a birthday party? Combine a mini golf adventure with a hands-on flower class for kids, and ice cream from Kallie’s Kones. We offer special pricing on birthday parties! We love hosting fundraisers for nonprofits! You set the rate, and how much profit you’ll make, and we’ll work with you on a package which could include food. Need an idea for a corporate outing? Mini golf is a great activity for a team-building afternoon or a corporate day out. Give us a call today to book a tee time for your staff. We’ll help you plan a fun and unique outing for your team. Interested in booking a party or fundraiser?